The Aston Martin name came from both the Aston Hill Climb where the first cars were raced and the surname of one of the founders – Lionel Martin. The company was founded in 1913 producing high performance cars that set many racing and speed records. The company along with Lagonda, passed ownership to David Brown in 1947 when the company saw a renaissance. The popular DB range of cars began production and with help from some innovative for the time TV and film appearances, not least at the hands of James Bond the brand gained a global reputation. Aston Martin have long produced graceful convertible versions of their luxurious grand touring coupes. Traditionally these were named Volante. The Volante name, meaning ‘Flying’ in Italian (as well as several other latin languages) was first used for the DB5 Short Chassis Volante with the drop-head DB4 and DB5s that preceded it being simply called ‘Convertible’. In recent times the name ‘Roadster’ has been used for the more compact two seater convertible V8 Vantage. 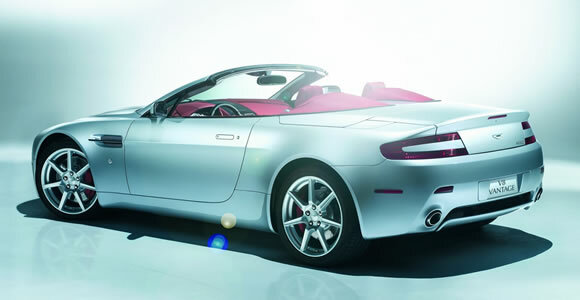 The Volante name however remains in use for the higher range DB9 and Vanquish Aston Martin convertibles. In comparison to other exotic cars Aston Martin’s remain elegant but subtle in a very British way. Although some of the cars are more accessible than they were a couple of decades back, itremains one ofthe world’s most distiguished and desirable brands.